Served with cabbage and potatoes for a traditional meal, or just thinly sliced hot or cold for mouth-watering sandwiches, Charlie’s Pride Corned Beef is always a resounding success. While striving to stay at the cutting edge of technology, Charlie’s Pride is committed to preserving the tradition of flavor and to produce the ultimate Corned Beef, never hurried, always succulent and delicious. And the majority of our Corned Beef is 95% fat free. You can feel confident that you have chosen the world’s best Corned Beef. 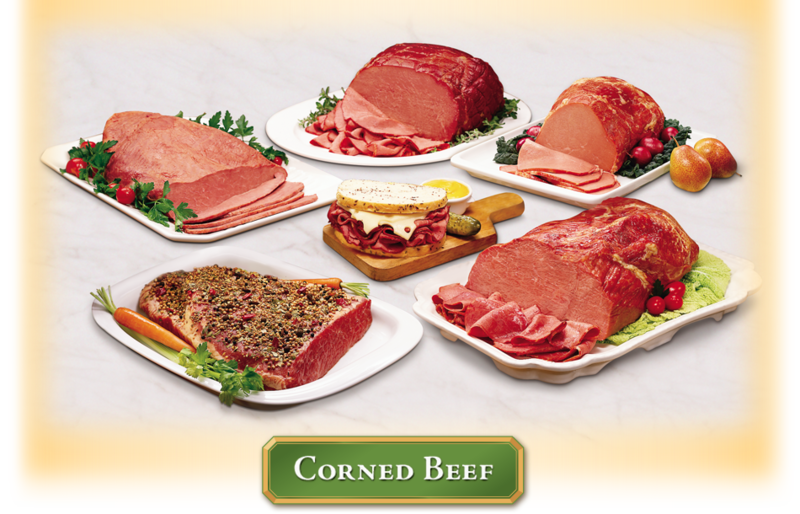 All of our Corned Beef items have 0g Trans Fat and No Added MSG. Available in back-to-beginning weight, with a 10% or 15% solution, or with isolated soy protein added. Sold whole (8-12 lbs) and deli-faced (4-6 lbs). Can be ordered bag cooked. Available in back-to-beginning weight, with a 10% or 15% solution, or with isolated soy protein added. Sold whole (4-8 lbs), or in quarter-piece chubs (2-3 lbs). Can be ordered bag cooked. Available with a 40% solution, with or without pickling spices. Sold whole (8-16 lbs) or half (4-8 lbs). Can be special ordered with an 1/8″ trim. Whole eye of round also available (4‑6 lbs). Great item for St. Patrick’s Day and for restaurants. Cook and serve warm. Available with a 28% or 40% solution, with or without pickling spices. Sold whole (8-12 lbs). Can be special ordered with an 1/8″ trim. Great sandwich item for traditional delis. Ideally served warm. Juicy and flavorful. Available in back-to-beginning weight, with a 10% or 15% solution, or with isolated soy protein added. Sold whole (8-12 lbs). Can be ordered oven roasted.